Th-INK-ing of You: Sing and Make Music! Ps, 95:1-3a "O come, let us sing for joy to the Lord, let us shout joyfully to the rock of our salvation, Let us come before His presence with thanksgiving, let us shout joyfully to Him with psalms. For the Lord is a great God..."
To read my devotional thoughts on this verse please be sure to stop by the SSCC blog! Music... can you imagine life without it? From the time we were little children, we all have loved music! Even unborn babies have been found to have a positive response to good music! God made us with this incredible ability to enjoy music, to be moved by it, and to make music ourselves! What a gift that is! He also made us to worship and praise Him! I love reading the Psalms of David.... because with full abandon, he loved to praise God for all His goodness, protection, wonderful works, and faithfulness. David praised God in many ways, but one of the major ways was through music...through singing, through musical instruments... and even in the dance. My challenge this week is to create a card that depicts music or joyful praise. I can't wait to see your creations! My card this week is a little different than my usual. I made the main panel a removeable bookmark. I stamped the flourish from Layers of Color onto white cardstock, cut it with the Spellbinders Mega Oval Die, and colored it with my Copic Air Brush. I then stamped the Verse from ODBD onto Acetate with Stazon ink and cut it with the same oval. I punched a hole in the top of both and tied the two layers together with a black ribbon. I added some musical notes to the dp from the same LOC set. The black mat is cut with a Tim Holtz Sizzix die cut (Bracket) and then embossed with the CB folder. The piano keys are stamped onto white and to achieve the curve I simply put the stamp on my block in that curved shape rather than straight. I thought it gave interest to the matting of the image and the whole musical theme. The corner treatments were also colored with the Copic Air Brush. The pretty Layers of Color Butterflies are heat embossed with Ultra Thick Embossing Powder and popped up. Our sponsor this week is Hambo Stamps which are donating a $15.00 gift certificate. Thank you Hambo for your generosity! Don't forget to stop by the Stampin' Sisters in Christ blog to see all the exciting creations the week. If you create a card or project for this challenge, please leave a direct link to your project on the Stampin Sisters Challenge thread. Also, please include a link to Stampin Sisters in Christ. Thanks for stopping by and for all your comments! Have a blessed day and I hope to see your take on this challenge soon! Hello Grace, what a masterpiece you have created here - a great tribute to the 'Chief Musician!' I love the dramatic colours and the way you have used the Layers of Color Joyful Noise art stamp set - you rocked it sister!! Wonderful card! I loved reading your blog post too! Two of you used the same color combo that I have never tried!Great images! Grace, your cards are masterpieces of art to be framed! Love the details and your musical theme and that wonderful Scripture! Such a gorgeous card Grace!! I love the colors and layout and all around beautiful card:) Have a great week! Beautiful colors and die combos! I like your verse and challenge today! What a beautiful card Grace,i love your image and your papers. This is a delight to the eyes Grace - I saw it over on the LOC group at SNR ad was blessed by it then. Love your inspiration and the beauty that results. Hi grace! I haven't gotten to visit in a while. Sorry about that. I guess life gets in the way sometimes. But, I was bound and determined to take some time out of my day today to make some blog rounds. :) Your blog layout is so pretty! and this card is no exception. WOW!! gorgeous! I love making music unto the Lord. God Bless you my friend! Grace -- thank you for such a wonderful challenge and for such a beautiful example for the challenge! I should have saved my card from last week for your musical challenge -- hmmm, now I've got to figure out another "joyful noise." Thanks for all your inspiration. A wonderful piece of work Grace, thank you for sharing it with us at Crafty Ann's. This is fabulous Grace. I love it. Thank you for sharing it with us at Crafty Ann's. Oh my word Grace this looks amazing...I am in AWWW over here...GORGEOUS work sweetie! This is gorgeous Grace!! I just love your color combo, the dies you used, and the butterflies you added. What an awesome musical card. Great choice of verses and challenge girlfriend!! This is beautiful Grace. It is your signature style..Super job. Grace, this is so beautfiul! It's just awesome! I love the piano keys! Hugs!! An amazing card, Grace!! Very creative, and beautiful!! This is simply gorgeous, Grace. I love all the greens and black combo. What a magnificent reply to a challenge. I'd say it is a masterpiece! I love how the keyboards curve! I wish I could understand better how you did that! Those butterflies with tiny notes on them are just wonderful. And, that verse is perfect for you to work with...your music on this blog is the best! I play it all day while I play! Magnificent!!! How clever to have the keyboard as a frame and love the music trail behind the butterfly!!! A truly stunning card!! Grace, I think that this card is stunnning. 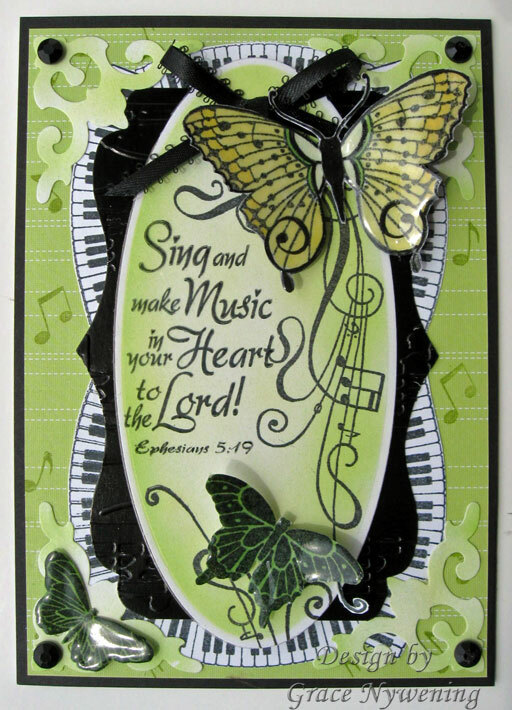 The colors and the beautiful butterflies and piano keys make the scripture pot out at you! Every time I see this is just makes my heart happy! I love music and you captured it so well on this card. Gorgeous colors and love the way you used the piano stamp around the outside. LOVE the verse --it's just wonderful and happy! I keep coming back to look at it and smile each time I do. I am a child of the King, a wife of 45 years, a mother, and a grandmother. I love almost all types of crafts from quilting to papercrafting. Card making has become my favorite passtime... I love it because it is not self focused... it is other focused. I enjoy making something that I know will bring comfort, encouragement, and maybe some joy to others. I am not what I ought to be. I am not what I wish to be. I am not even what I hope to be. I am not what I was. I am so blessed to be able to look out my windows at sunset and see this glorious sight! God is so good! Ricky My Best Ever Fur-Buddy! A glass block gift idea! ODBD Feb. release Blog Hop! Christmas to Birthday BLOG CANDY! Happy Big 50 Birthday Kelley and more! Water Globe Gift Idea for Christmas! Welcome to the February ODBD Release! Friends are Flowers in the Garden of Life! These are my personal creations. Please feel free to enjoy and use them for your own personal inspiration. They are however NOT to be copied, captured, or used in any way for publication, contests or sale without my express permission. I thank you for understanding.